Science journalist Gaia Vince left her desk at Nature and spent two years visiting places around the world, some of them very isolated, where people were grappling with the conditions of what is sometimes described as a new epoch, the Anthropocene. It dates from the industrial revolution and represents a different world from the relatively settled Holocene in which human civilisation was able to develop. 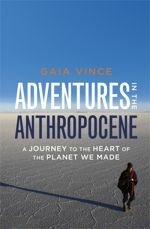 Adventures in the Anthropocene tells the story of Vince’s encounters with some remarkable individuals and their communities. It also includes lengthy musings on the technologies the future may employ as humanity faces the challenges of climate change, ocean acidification, population growth, resource depletion and more. Vince goes to the front lines of the human battles. In a remote village in Nepal she describes the extraordinary work of Mahabir Pun who gained a university scholarship in the US and returned years later to bring computers and Wi-Fi to the children of his village. It’s a fascinating story, full of hope for development in his region. But it’s also precarious. Electricity for the computers comes from a small hydro-scheme fed by glacier water. In the same chapter Vince points out that the warming rate in that Himalayan region is five times greater than the global average and the glaciers are melting. Once they are gone there is no meltwater and no power. Levels have already been diminishing in the once-deep stream near the village. Nowhere is the precariousness of forward-looking attempts to carve out development in the Anthropocene more poignant than in the Maldives where Vince expresses her deep admiration for the work of since-ousted President Mohamed Nasheed. All the impressive attempts to adapt to rising seas and to set an example of renewable energy development are clearly doomed by inexorable sea level rise, as the author explicitly recognises in her fictional epilogue. Vince spends time with renowned activist Rosa Maria Ruiz in the Amazon forest. Here the immediate danger is not (yet) from climate change so much as from the human forces hell bent on destructive activity which will hasten its onset. Vince reports Amazon activists killed at the rate of one a week in 2011. It is not at all clear that government control will be asserted to protect significant sectors of the great forested areas. The book’s stories from a great variety of different places around the world are valuable chronicles of how individuals and larger communities are seeking to sustain and enhance human life in often difficult circumstances. Vince acknowledges those difficulties and gives them due weight. The relentless pressure of climate change is always prominent among them. She can be quite brutal about the realities. For instance she describes the aim of experimenters she visits in the Brazilian Amazon as being “to discover whether the Amazon will reach a tipping point and change rapidly to desert, or gradually worsen, perhaps giving us time to act”. She can also point to reasons for optimism. The vast unexploited tracts of sun and wind-exposed deserts are seen as the key to future energy production in the Anthropocene. But at the same time there are very few signs of the uptake of renewable energy at a rate sufficient to replace fossil fuels in good time. China, Vince says, needs to be bolder in its development of non-carbon energy. Threats and opportunities jostle in the communities Vince visits and in her book. For all her recognition of human adaptability and inventiveness and her innate optimism she cannot assure her readers that all will be well for humanity in the Anthropocene. It is city life on which she places most of her hope. Cities may be the most artificial environment on Earth, but they are where humanity feels most at home, and they may well be where our demands on the environment can be most minimised. Not that she idealises them – her account of wading through a stream of raw sewage to reach a shanty slum she wants to visit is one of the memorable moments in the book. Cities can include areas of extreme deprivation, as described in the city of Khulna in south Bangladesh where 40,000 flood-displaced migrants were joining the slums each year. But slums can be rebuilt and cities ultimately deliver better lives. Colombia’s Medellín is offered as a prime example. The book provides impressive city statistics. If the population of a city is doubled, average wages go up by 15%, as do other measures of productivity, like patents per capita. Economic output of a city of 10 million people will be 15– 20% higher than that of two cities of 5 million people. At the same time, resource use and carbon emissions plummet by 15% for every doubling in density, because of more efficient use of infrastructure and better use of public transportation. Cities are certainly growing fast. A million-person city will be built every ten days for decades to come. By 2030, 75% of Chinese will live in cities; thirty years ago, less than 20% did. Vince’s cities chapter includes lengthy surveys of ways in which such highly urbanised life can be sustainable, while acknowledging that some existing cities will be drowned by rising seas. The author emerges from her invigorating tour of the Anthropocene with hope grounded on the human qualities she has encountered on her journeys. Let’s hope there is enough power in the qualities she lists to see humanity through the crises ahead. But there are also darker forces at work driving us to environmental destruction of massive proportions, and it remains an open question as to which will prevail. Vince doesn’t pretend her book answers the question conclusively. But she does offer some plausibility for a better outcome than many of us fear.